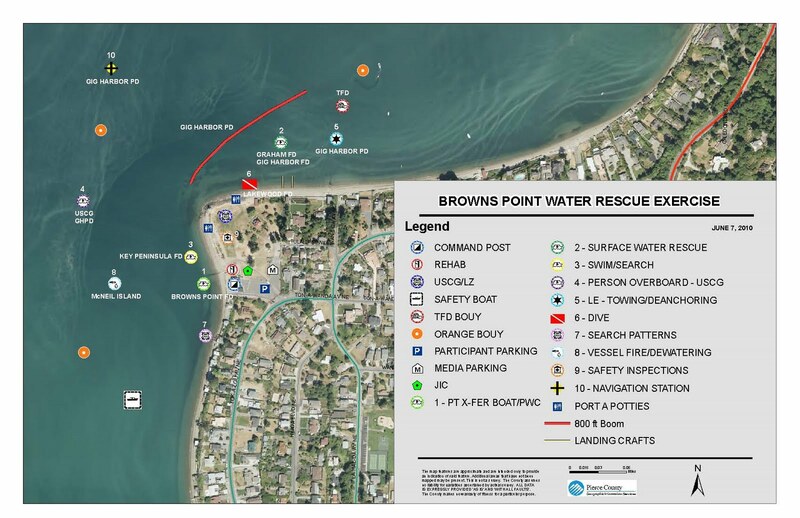 On Thursday June 10th, 19 agencies will be exercising rescue missions and security response in the Browns Point Area of Tacoma. Participants will start gathering at 7 a.m. at the Browns Point Improvement Club, 201 Ton-A-Wan-Da NE. The drills will begin around 10 a.m. and the goal is to evaluate both individual agency capabilities and their ability to effectively communicate and work together. This exercise series (designed to last approximately six hours) includes simulations of rescue swimmers hoisting victims into a helicopter. Responders will also have the opportunity to practice their skills using personal water craft and boats in rescues, as well as practice response to a vessel fire simulation. A subsurface dive rescue team is also included in the response. Marine units will train using different vessels simultaneously during the water rescues. Participating agencies include Browns Point/Dash Point Fire Department, Central Pierce Fire & Rescue, East Pierce Fire & Rescue, Gig Harbor Fire and Medic One, Gig Harbor Police Department, Graham Fire & Rescue, Key Peninsula Fire Department, Lakewood Fire Communications, Lakewood Fire Department, McNeil Island Fire and Rescue, Pierce County Emergency Management, Pierce County Regional Air Support, Pierce County Sheriff’s Department, South King Fire & Rescue, Tacoma Fire Department, Tacoma Police Department, United States Army – Joint Base Lewis-McChord, United States Coast Guard, and the Washington State Department of Corrections.